A set of four elegant dining room chairs, Italy circa 1960, black lacquered wood, newly upholstered and newly upholstered with Designer Guild ribbed velvet fabric. Measurements: height 85 cm, depth 45 cm, width 44 cm, seat height 46 cm. very good vintage condition, newly padded. 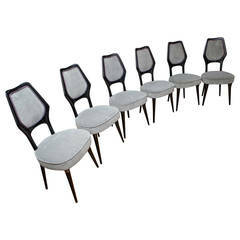 Set of six chairs by Vittorio Dassi, Italy, circa 1950, newly restored, black shellac polished, reupholstered by Dedar. Set of four Sax chairs, made in Denmark, 1960, teakwood base, seat in black imitation leather. 1960s, sassy seating from Italia to your dining room. Massive brass set of four.